Blackstone Bicycle Works is an offshoot of the creative incubator known at the Experimental Station (located at 61st and Blackstone). Recent recipients of Seattle’s Best Coffee’s Brew-lanthropy Award, the Bicycle Works has been teaching local youth Bike Mechanic skills as well as healthy life lessons since 1994. 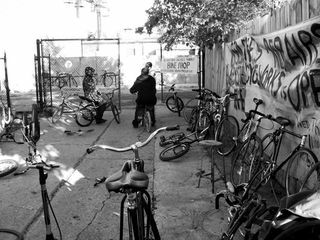 They offer reasonable bike repairs and sell refurbished bikes in the space starting at $90.